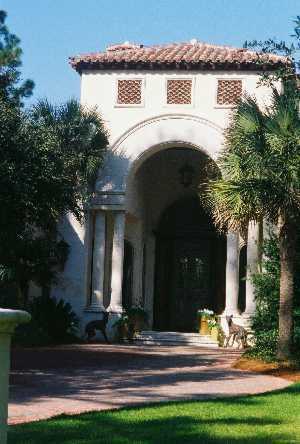 Visitors approaching 302 Sea Island Drive should pause briefly to absorb the beauty of the magnificent front door, for it provides a brief hint of the rarefied treasures beyond the threshold. 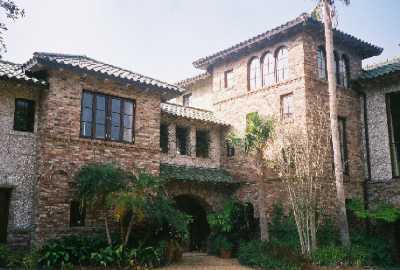 This home was completed in 2003 for a couple who have an unmistakable passion for collecting exquisite antique Asian artwork. Soaring ceilings and expansive interior views provide a backdrop worthy of their collection which includes furniture, paintings, textiles, sculptures, ceramics and much more. Virtually every item in this home has a fascinating story to tell. Guarding the living room from the height of the carved mantle is an imposingly fierce "Tomb Guardian Vanquishing a Demon" dating to the Tang Dynasty. A diminutive case clock features delicately depicted details of daily court-life. Before the enormous window overlooking a serene outdoor bathing pool, unusual red benches may have once seated royalty atop the back of an elephant. Two side chairs feature a profusion of flowers and vines deftly executed in mother-of-pearl inlay. To describe the many riches in this six-bedroom home would be impossible. Suffice to say guests should allow plenty of time at this stop to fully appreciate the architectural splendor of this home and its treasury of magnificent objets d’art. Cottage 122 is a masterful blend of classic design and modern luxury. Created in 2004 by Summerour & Associates for a family with five young children, this shingle-style home features arts and crafts design elements. 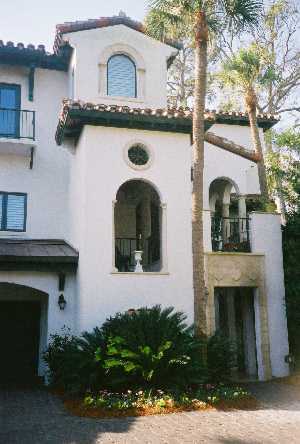 Encompassing nearly 6,000 square feet, it would seem a paradox that the home brings to mind the art of a boat-builder. Nonetheless, the analogy is apt because every inch has been created with furniture-like craftsmanship and a marvelously efficient use of space. Off the bluestone entry is a sophisticated salon crowned by custom timber framing. 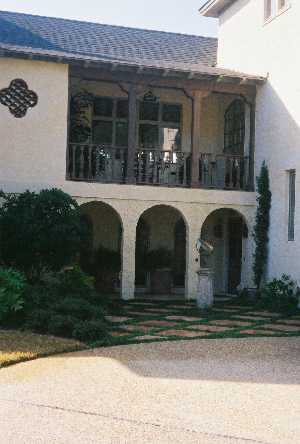 This leads to a unique circular screen porch designed after the historic Bell House in Newport, Rhode Island. In the kitchen, warmth abounds with pale blue distressed cabinetry, azul limestone countertops, handsome farmhouse sinks, and an extraordinary antique glass and iron light fixture. These features complement the elegant dining and living areas nearby. Take a close look at the walls in the family room -- there is more here than meets the eye. Upstairs is an array of whimsically-themed bedrooms for the couple’s children and guests. Don’t miss the secret bunkroom and the faux-bookcase concealing a home theater! Visitors will delight in the hidden surprises throughout this unique home. 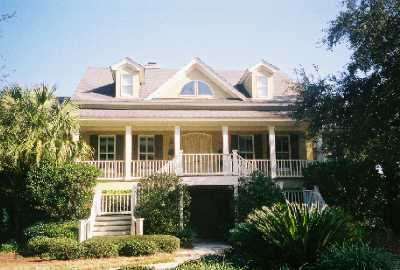 Lucky are the families and friends who frequent this casually elegant home at the edge of the marsh! The homeowners sought local interior designer, Laurie Mercer, to help them create a comfortable venue where guests of all ages could mix, dine and enjoy time together. Further guiding the design was this family’s love of fishing, hunting and the spectacular outdoor scenery visible from almost every room. The result is a subtly-crafted balance between refinement and comfort. Lovingly featured in the dining room is a display of serving pieces and heirlooms reinforcing the home’s central theme of family. Furnishings throughout feature fabrics and textures which reflect the delicate colors of nature outside the window, but stand up well to the activities of two young sons and their friends. The favorite destination for young and old is undoubtedly the downstairs entertainment area which includes an expansive playroom, kitchenette and a state-of-the-art home theater. H & H Electronic Lifestyles masterminded the theater where one can sink decadently into a cozy armchair while taking in a favorite film or simply relax under the magical star-studded ceiling. This is a home where a young family will find comfort and friendship for years to come. 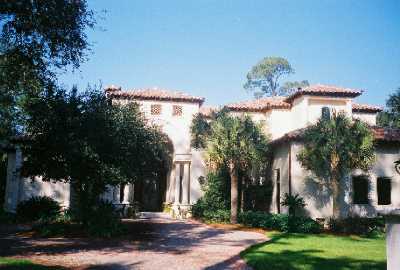 800 Hamilton Landing Drive is styled after a tranquil, ancient Mediterranean villa. Linda Lindsey Designs skillfully executed not only the architectural design of this home, but the interiors as well. Foreshadowing the frequent use of religious imagery throughout the home, the entry features a century old oil-on-copper painting of the Madonna and Christ Child. Handsome slate flooring and subtle faux finishes, masterfully applied by the talented homeowner, lend depth and richness throughout. Also by the homeowner is a mural, on the tower ceiling, depicting a map of the beloved Marshes of Glynn. While enjoying this home, visitors will marvel at the frequent use of "found objects" which have cleverly been given new life. 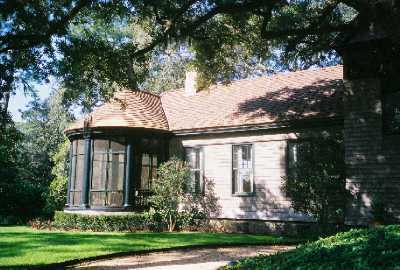 These include a powder room sink which once served as a fountain in a faraway village; an antique navigational instrument refashioned to serve as lighting in the central staircase; and antique leaded-glass windows, embellished with dates and coat-of-arms, which served a German cathedral in the early 1800’s and now grace the home’s refined main living area. Visitors to this lovely home will appreciate the use of antique architectural elements and decorative details which have been imaginatively utilized to impart the warmth of age to a newer home. At this home’s entry visitors glimpse an extraordinary Native American beaded garment, lovingly crafted for a child. This garment serves as an introduction to a virtual treasure-trove, meticulously collected over a period of 25 years, by the homeowners of Tour Stop 5. The collection includes an impressive selection of museum-quality Native American basketry, beadwork, masks, pottery and textiles. Local interior designer Mary Bryan Peyer has skillfully blended these unique items with fine European antiques to create a haven for friends, children and grandchildren. Truly the heart of this home, the dining area features a welcoming round table crowned by a handsome 19th century iron chandelier. Further dining pleasure can be found outdoors on the beautifully-appointed screened porch overlooking a verdant, palm-studded lagoon. Separating the dining area from the kitchen is a hand-painted screen depicting sea-side views by local artist, Virginia Kalp. Don’t miss a peek into the fanciful first-floor powder room featuring clever drapery and an exotic shell mirror, created by local artist Annette Friederich. When viewing the upstairs bedrooms, be certain to observe the delicate, hand-embroidered Indian drapery panels, as well as the antique carved Spanish door serving as a headboard in the master. Take pause to enjoy the many small surprises throughout this fascinating home. 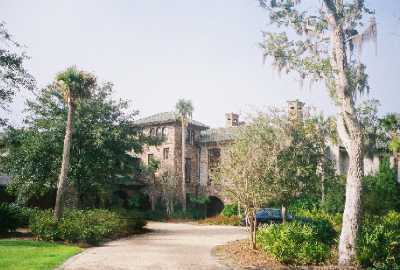 Entering this residence, one is reminded of the soft, nature-inspired interiors of the film, Out of Africa. Creamy, white walls provide a warm backdrop to the textural animal prints, horn trophies, soft upholstered pieces, and gleaming wood surfaces of a unique collection of antiques. The homeowner’s pleasure entertaining family and friends is evident upon entering the gleaming, well-appointed kitchen. Clearly a place to find good food, drink and company, the kitchen is adjoined by a luxuriously-appointed wet bar and a sumptuous seating area where the hostess can visit with guests while whipping up some southern culinary magic. The living/dining area features an assortment of unusual items including an intricately carved antique French buffet, a handsome candelabrum crafted from horn and silver, and a coffee table cleverly fashioned from an antique baby cradle. Upstairs, is this home’s pièce de résistance -- a meticulously-designed dressing room and adjoining bath. Once a small bedroom, this area now showcases a delightful array of beautiful garments and the owner’s charming collection of hats – the star of which is her own childhood Easter bonnet. Finally, don’t miss the master bedroom’s gorgeous hand-painted headboard and antique French miniature armoire. 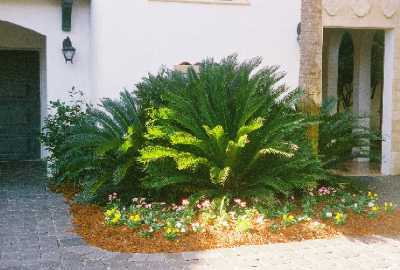 Visitors will enjoy the graciousness and personality of this home. 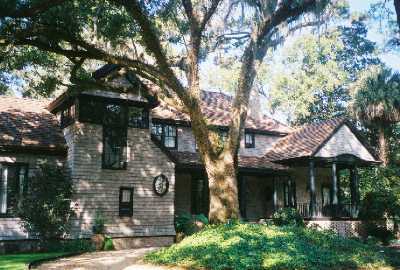 A secluded, gently winding drive sheltered by majestic oaks introduces visitors to the quietly elegant One Everglade Drive. The home emerges overlooking a pristine, twenty-nine- acre expanse of marsh. Designed in 2003 by Summerour & Associates and crafted by E.G. 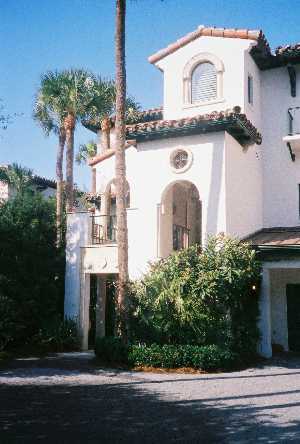 Pope, Inc., this home’s architecture, landscaping and interiors feature frequent references to Moorish and Spanish design. Interior designer Lisa Torbett and the homeowners have taken obvious pleasure in their quest for antique lighting fixtures, furnishings and architectural details. Unique ceiling treatments feature exposed beams, groin vault-work, unusual woods, and custom paint finishes. Custom ironwork includes a gate, visible at the home’s entry, depicting an abstract representation of an oak, trailing moss and surrounded by marsh grass. Hand-rubbed mustard cabinetry, limestone flooring and colorful Portuguese tile warm the kitchen. Furnishings in the second-floor salon, and throughout the home, feature a combination of comfort and refinement enhanced by a calming palette and sumptuous fabrics. Serene bedrooms overlook the peaceful beauty of the marsh. A favorite is a richly appointed suite, approached by an enclosed outdoor walkway, which houses a private haven for guests and the owner’s home office. 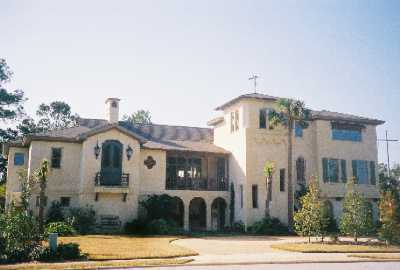 Visitors will enjoy the one-of-a-kind details and luscious surroundings of this home.